Born and raised in New York City, Mark Texeira found himself indoors often and drawing pictures as entertainment. With the help of an inspiring Junior High teacher (Mrs. Honest, honestly, that was her name) he was guided to studying at the famous Art & Design High School in Manhattan, which boasts alumni such as Tony Bennett, Harvey Firestein, Steve Asell, Eric Valazquez, Neal Adams and Willie Low, among many others. Under the guidance of painters Max Ginsburg and Irwin Greenberg, Mark was granted the Presidential Scholarship at S.V.A. which he was to prematurely drop out of 2 years later. While pursuing a graphic art career on his own, he studied under portrait painter David Leffel at the Art Students League. Mark soon won mentions at the Salmagundi Club and Society of Illustrators for his oil paintings which sparked some interest and some work in the form of cover assignments for books, magazines and record albums involving such properties as Remo Williams, Buckaroo Banzai and Public Enemy. 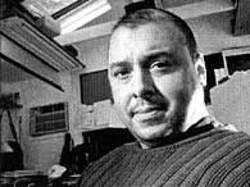 At 28, Mark married and worked for Continuity Associates, illustrating the MEGALITH book and ads for MARLBORO and SALEM. He soon returned to freelance! Transplanting his family to Westchester he has spent years haphazardly eaking out a good living only by burning the midnight oil. And now he's added his first creator owned graphic series to his already hefty workload. Mark Texeira hopes you will enjoy the debut of PSCYTHE, in the next year or so, as much as he has enjoyed working on it!